If you are, somehow, not one of the $1.5 billion worth of people that made up The Avengers audience this summer, you may want to avert your eyes from these spoilers. 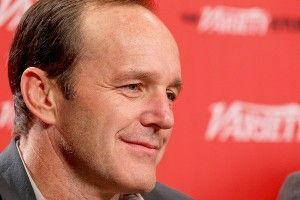 For the rest of you: Hey, remember Agent Coulson? The straight-laced but still kind of badass S.H.I.E.L.D. bureaucrat played by Clark Gregg? The guy whose brutal death at the hands of Loki united the bickering Avengers when nothing else could, because he used to collect their trading cards and that used to mean something in this country, or something? Well, he’s not dead anymore. Yep, he got shot up by all kinds of secretive high-tech government weaponry. But nope, not dead anymore. At this weekend’s New York Comic-Con, Marvel announced that Joss Whedon has cast Gregg as Coulson in S.H.I.E.L.D., the ABC series that’ll take place within The Avengers‘ universe. That show, which Whedon is co-writing with his brother Jed Whedon and Jed’s wife Maurissa Tancharoen (the team behind “Dr. Horrible’s Sing-Along Blog”), has been ordered to pilot and starts production, like, now. So: how come Coulson lives? Does the show take place in the past? An alternative present? The future, where we finally figure out how to cryogenically unfreeze people and get them walkin’ and talkin’? Or maybe it’s just that Whedon is — as all rational people are — a huge, huge fan of Gregg’s work on The New Adventures of Old Christine, and knew it’d be totally crazy to create a TV show that didn’t deploy the small-screen assassin’s manifold skills? Certainly, answers will come. But for now: Congrats on your reanimation, Clark Gregg! What was heaven like?